After hitting records in October, the stock has slumped 33 percent in one of the worst performances on the Dow. Its technical setup is pointing to more pain, says Bill Baruch, president of Blue Line Futures. "Apple has gone lower than I thought it would," Baruch said on CNBC's "Trading Nation" on Thursday. "You're getting a death cross. 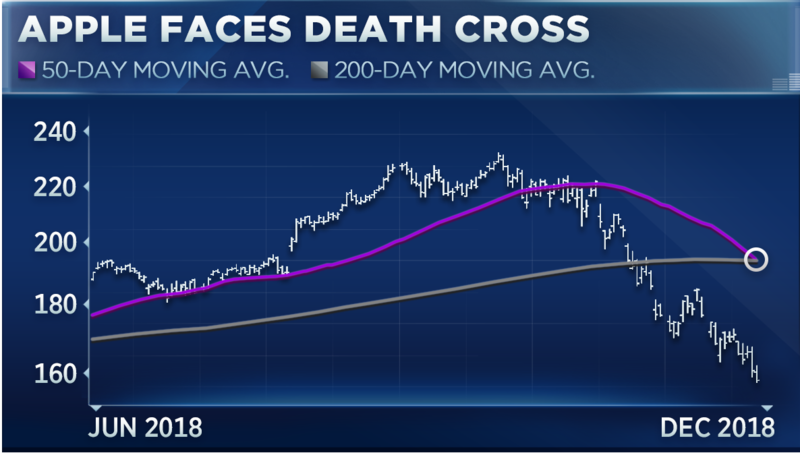 It's one of the many different stocks out there that are seeing a death cross." A death cross is formed when a stock's 50-day moving average crosses below its 200-day moving average. The bearish technical move implies the rapid deterioration of a stock's upward momentum. "I think the downside could potentially be $144," he said. "You may not get there, but you have to plan for the worst." A move to $144 would mark an 8 percent decline from current levels. Such a drop would push Apple down 15 percent for the year. "What we have going on right now in the marketplace is what I'd call a buyers' strike, so it doesn't really matter if it's a name that's worth buying that you want in your portfolio for the next two years or a name that's still overvalued here. The buyers just aren't there," Gilbert said on "Trading Nation" on Thursday. Even so, to the long-term investor, Apple's sell-off could present a discount opportunity. "If I were looking to something like Apple, if you like the stock, if you like the valuation, I do think that this is a name that in your portfolio two years out, you're probably happy you own it," said Gilbert.